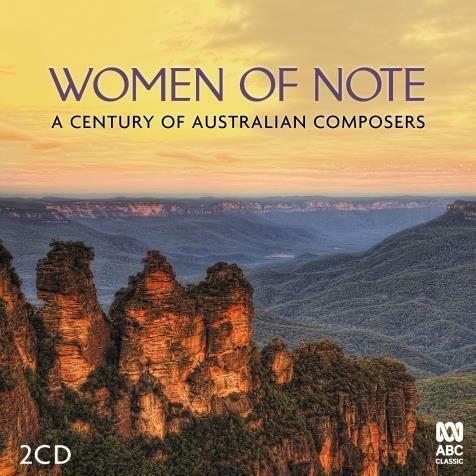 This International Women’s Day (March 8), ABC Classic is releasing Women of Note: A Century of Australian Composers -the first in a new series celebrating Australian female composers. Australia has always punched above our weight musically, our female musicians especially -Nellie Melba, Joan Sutherland and Eileen Joyce in particular loom large among the finest musicians of the twentieth century. But beyond these celebrated performers, the history of Australia’s female composers is equally outstanding. Miriam Hyde,Dulcie Holland and Margaret Sutherland were hugely influential in the early years of Australia’s musical development. Peggy Glanville-Hicks and Anne Boydlooked beyond our borders to the musical traditions of other cultures, and sought to find a place for Australia among the community of musical nations. Elena Kats-Cherninis a phenomenon unto herself, arguably Australia’s most popular and best known composer. Yuinwoman Brenda Giffordbrings insights from her Indigenous culture to the Western classical tradition. And composers such as Sally Whitwell, Maria Grenfell,Kate Moore,Nicole Murphy andOlivia Bettina Davies represent the myriad ways in which classical music is developing in the 21st century. 2019 has seen a welcome proliferation of recordings featuring music by women. Although for a long time musical women were actively discouraged from composing and audiences were less willing to open their ears and minds to their music, finally the world seems to be listening. Australia alone has produced swathes of first-rate female composers, however little of their music currently makes it into our national operatic, orchestral and chamber music programs. To coincide with International Women’s Day, ABC Classics has released a timely 2CD collection of music by our women, from Margaret Sutherland (1897–1984) to Kate Moore (b. 1979). It comes as no surprise that the women represented here were – and are – bold: Sutherland had to push back against a psychiatrist husband who believed that a woman who composed was mentally deranged, and, against odds, Peggy Glanville-Hicks was among the first women to receive recognition as an opera composer. Some music on Women of Note – such as Glanville-Hicks’s Etruscan Concerto and Elena Kats-Chernin’s Russian Rag – will be familiar to listeners, and some, including Brenda Gifford’s Bardju and Olivia Bettina Davies’ Crystalline, will be less so. Regardless, all of it has merit, and the collection highlights the sheer inventiveness and, dare I say, genius of Australian female composers. The featured performers, ranging from the Melbourne Symphony Orchestra to the Benaud Trio, and to Sally Whitwell who accompanies flautist Sally Walker in a performance of Whitwell’s own ‘Road Trip’, are Australia’s finest, and sound possibly at their best in the music of their homeland. However, there is still work to be done: the majority of conductors leading the larger ensembles are men, which is no surprise considering that conducting is still a very male-dominated area of classical music. Despite this unfortunate shortfall, Women of Note is essential, urgent listening.